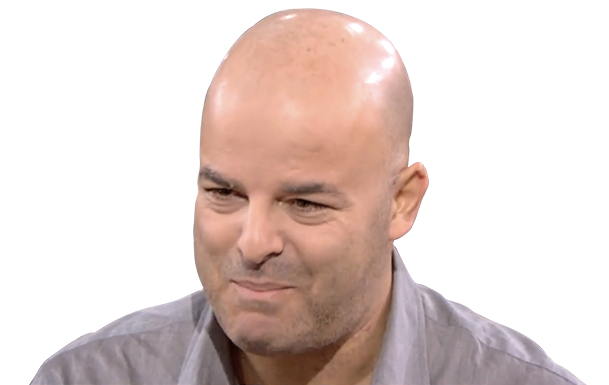 Ronnie Moas -- Founder of Standpoint Research -- top-ranking stock picker 2008-2017. More than 100 television, newspaper, radio and magazine interviews since 2014. Daily notes and 50-75 stock recommendations annually. Try our independent and conflict-free research. Ronnie also covers cryptocurrency and his name has become synonymous with Bitcoin. In July 2017, when Bitcoin was trading below $2,500, Ronnie set a $50,000 target price for 2027 -- by March 2018 Bitcoin was already above $10,000. Sign Up for free to start learning NOW. 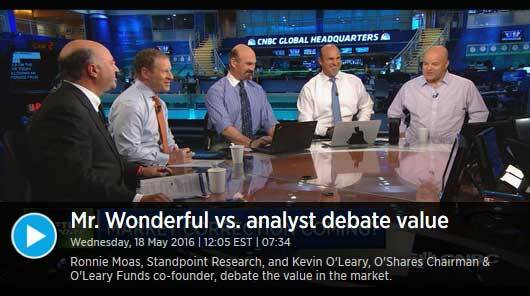 Ronnie Moas -- Founder of Standpoint Research – top-ranking stock picker 2008-2017. More than 100 television, newspaper, radio and magazine interviews since 2014. Daily notes and 50-75 stock and crypto recommendations annually. Ronnie covers cryptocurrency and his name has become synonymous with Bitcoin. In July 2017, when Bitcoin was trading below $2,500, Ronnie set a $50,000 target price for 2027 -- by March 2018 Bitcoin was already above $10,000. Sign Up for free to start learning NOW. Daily notes, recommendations, reports and updates sent via e-mail. Approximately 50 stock and crypto recommendations per year. Discounts are available for individuals and students with less than $50,000 in the market. Basic and Premium options are available which will be explained in the initial telephone conversation. Daily notes, recommendations, reports and updates sent via e-mail several times per week. Approximately 70 recommendations per year. Institutional clients and high net worth individuals receive portfolio diagnostics reports. In these reports clients get to see how their holdings and focus list names rank on an absolute and relative basis according to the 155-variable computer model that took Ronnie five years to develop. Basic and Premium options are available which will be explained in the initial telephone conversation. Ronnie has a # 1 ranking versus more than 3,500 analysts for his 2008-2017 performance. That covers all of the more than 500 recommendations he issued since 2008 – all time-stamped by Bloomberg, Dow Jones and Yahoo! Finance. 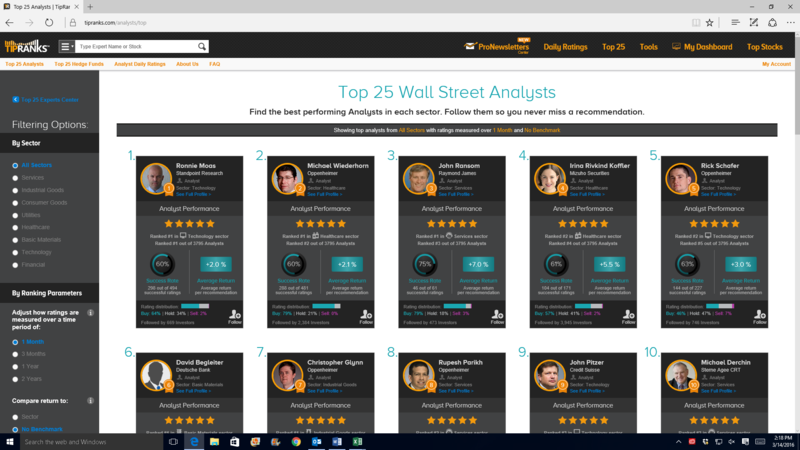 See two attached files – the screenshot compares Ronnie to 3,795 analysts and the Excel file compares Standpoint Research to more than 150 research firms. Standpoint Research is now widely regarded as one of the top equity research firms. Ronnie has given more than one hundred (100) television, newspaper, radio and magazine interviews in recent years. See bottom of Home page for links to three of his favorite interviews. Ronnie has an MBA from City University of New York (Baruch) and has authored more than 1,000 research reports during his career. Click here to see a sample report (45 pages). He started Standpoint Research in 2004 after spending five years (1998-2003) developing his 155-variable computer model – click here. Ronnie was a sergeant in the Israeli army (1987-1990) and he has visited more than 70 countries on six continents. Mr. Moas has 1,500 cds in his music collection and has been to more than 200 concerts. He also runs a humanitarian/activist website www.philanthropyandphilosophy.com… a fundraising page www.foodforthepoor.org/Moas… and a photography site www.moas-photo.com – Ronnie moved to Miami Beach from New York in 2010. Standpoint Research provides independent equity research that is free from the conflicts of asset management, investment banking, proprietary trading, and fee-for-research arrangements. We provide thorough analysis, diagnostics and forecasts on domestic and international equities. Ronnie spent several years developing a proprietary 155-variable valuation and diagnostics model to assist him in generating equity investment ideas. In addition to his quantitative model, Ronnie and his team also apply proven fundamental and subjective overlays in their research before issuing a recommendation. I have known Ronnie for 18 years. His estimates of what would happen during several market cycle events turned out to be surprisingly accurate. Also impressive to me is Ronnie’s wide travel experience, so that his views about developing countries and the rest of world possibilities and opportunities are thus more important than those of others who are simply rehashing work they may have read and not based on their own observations, as Ronnie’s are. This larger and better informed view of the investment world make Ronnie’s service very valuable.